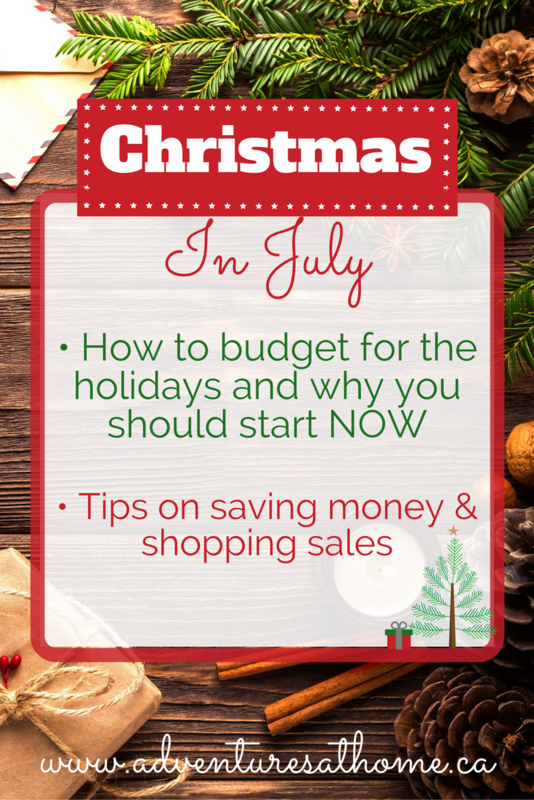 Christmas In July!- How You Can Start Saving For Christmas Today! Save your cash, save your cash, save your cash. Do you guys feel like Christmas sneaks up on you every year? Personally, I usually start my shopping around Black Friday, and continue shopping all the way up to Christmas Eve. This year I've decided that I'd like to enjoy a relaxing holiday season instead of scrambling to shop every pay day. Here are some tips I've come up with that will help you start saving for Christmas now, and buy some things along the way. Set your budget now! Do you use the 5 gift rule (want, need, wear, read)? Do you like to buy lots of gifts with no set rules? Either way, it's great to set your budget now, so as you buy things in the coming months, you can keep track of what you're spending. I don't have any set rules when it comes to buying gifts for our son, but I've definitely been trying to be more mindful when it comes to spending. Every year we do one big gift, clothes, a couple of smaller toys, a Christmas Eve Box (book, movie, PJs, stuffie, snacks) , and stocking stuffers. The grandparents usually spoil him, so we try not to over do it. I already know what his big gift will be this year, and I'm going to be saving for that. The smaller gifts are going to be bought between now and Christmas. Start setting aside money every week! When we calculated it, my husband and I realized that we spend $25-$50 a week on Tim Hortons and other junk we don't need. My iced caps can be made at home for a fraction of that, and the rest can be saved for Christmas. Even if we save only $25 a week, we will have around $500 by December. That's a decent chunk of Christmas change! Start making your lists now and buy things when they come up on sale! I know, kids change their minds A LOT, so you wont be able to get everything this early, but there is a lot that can be checked off the list. Stocking stuffers are great to buy ahead of time, because those items wont be something your child wont like or need in 5 months. I would also suggest buying for your friends and family early if possible. I personally find it really easy to shop for my parents, or friends because I know what they like and can buy things as I see them. I LOVE a good sale and the emails I receive on a daily basis from my favorite stores would agree. Check the flyers and stores often for clearance items, upcoming sales, etc. One of my favorite clothing stores for my toddler has a huge clearance sale happening now- and you better believe I'm buying him clothes in the next size up to give him for Christmas. Buy gift cards! If you are bad at saving money, buy gift cards for stores that you know you'll be buying gifts at. For example- I ALWAYS go to Toys R Us for Black Friday, so instead of trying to save money, I can buy myself a Toys R Us gift card every time I get paid, so I'll have those to spend on that day. You could also start buying gift cards for family and friends who you want to give gift cards to. If you buy them gradually between now and December, it won't seem like a big expense right before Christmas. Plan experience gifts ahead of time. Something I've been trying to do over the past couple of years is pay for experience gifts instead of physical gifts for my son. Last year we paid for a Movin Munchkins membership as one of his gifts, and paid for it in October. If you want to do experience gifts, I would recommend checking the schedule for swimming lessons, dance classes, concerts, etc now so you can get them signed up and paid for ahead of time. Comment below and tell me how early you start Christmas shopping and what you do to save!